When Was the Last Time You Used the Yellow Pages? I’m guessing not recently. Am I right? I mean maybe you’ve used it to prop open a door or serve as a booster seat for a small child, but as far as a reference tool its kinda been outmoded. What do you do. What do I do? What do our customers do? They Google it. At minimum a small space ad will run you $600-$1200. Full page ads can go up to the many, many thousands of dollars per year. I have to ask….why? I don’t wish to begrudge the fine people at the phone companies, I really don’t. But they force these things on consumers. And most people I know either cram it their kitchen cabinet or immediately drop it in the recycle bin. I swear, within the last year, my office had 4 of these things piled up and waiting for me on my doorstep. Why would I need four? The point I’m trying to make is this: Phone books served a viable marketing purpose at one point. They were key tools for when people wanted your product or service they would use it as THE reference tool to find you. The yellow page equivalent of black hat SEO in the early 20th century? Naming your company AAA Widgets so you’d be sorted at the top. But there are advertisers spending good money on yellow page advertising who would never even consider spending an equivalent amount on their search engine optimization or content marketing efforts. Does this make sense? Effective budgeting of marketing resources can be a challenge. The answer is not always easy. This is especially true in the beginning when you are not yet aware of what works and what does not. Not to mention even those seasoned “pros” who have strong marketing campaigns going can make the mistake of getting behind the times. What once worked well may not work well now. In fact, what works well now someday may be obsolete. On that note, this is where you have to think about the Yellow Pages and phone books in general. While they were once the foundation for marketing your business, it is time to really think back to the last time you used the Yellow Pages yourself to find something. More and more people are even phasing out having a home telephone at all, making the Yellow Pages less important when it comes to advertising. The problem is many smaller, locally owned businesses have come to rely on phone books as the main method of attracting local business. For a long time people searched online for internet based businesses but still trusted the Yellow Pages for what’s available in their own backyard. Unfortunately, this just isn’t the case any longer. There are too many ways to search online for things, including using online Yellow Pages. People rely on apps or their own GPS system to find what they need and take them where they need to go these days. Not to mention the bottom line is that advertising in the Yellow Pages is still a very expensive approach to take. If you want to increase your inbound marketing or even in person results, it is important to spend every marketing and advertising dollar you have wisely. While the Yellow Pages was once the only reliable source for finding businesses, people now rely largely on Google. People search for things on their laptops, smartphones or mobile devices and never even consider picking up the phone book anymore. The trick is to make sure your internet marketing approach reflects this. 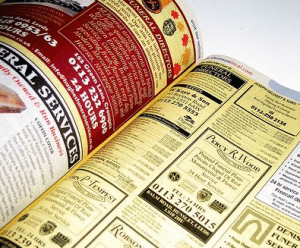 Let’s be honest; even if the Yellow Pages ads were not so expensive, they would still be hard to justify if no one uses it any longer. It isn’t meant to be a put down to the phone book, it’s just that times have changed. To get online business and even to get customers to your physical location, focusing on your internet marketing campaign is the way to go. It is better to try to utilize tools for organic marketing to rank higher on Google. However, the money you were going to spend on an ad in the Yellow Pages could now be used for internet marketing and advertising methods. The trick is to stay current. Learn from mistakes in your past efforts, but also stay up to date on marketing techniques as these are ever changing. What worked in the past may not continue to help you for the future. → As Google+ Adoption Increases, Will Google Analytics Becomes Less Useful?